You have added Designer Pant Style Salwar Kameez In Green Brasso Floral Embroidered to your Shopping Bag! Step up your sartorial game with this green brasso embroidered salwar kameez. Intricately embroidered neckline matches perfectly with the embroidery on the hemline of the kurti. 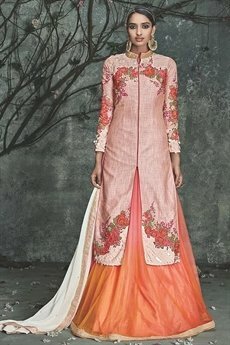 It’s teamed with a matching pure nazneen dupatta and comes with matching shantoon inner. Its bottom can be stitched as a pair of straight pants. You can complete your look with a pair of chandbalis and go for smokey eyes.